Avanos, a Hitite city in the World Heritage region of Cappadocia in Turkey, is an ancient town where people still live in rock houses carved into the famous basalt formations. 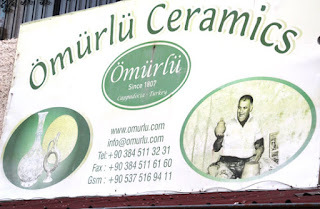 Its other claim to fame is that Turkey’s famous pottery is made here, so I really enjoyed our visit to Omurlu Ceramics on our recent trip to Turkey. Kizilirmak River, the longest in Turkey, starts at Mt. Arafat, flows through the town of Avanos, then makes a U-turn and goes back to the Black Sea. On the banks of this river is a red-hued clay used in making the pottery. The Omurlu family has been making pottery for 200 years—that’s seven generations—and we met with Hassan, the oldest son who is now in charge. Pottery display and reception rooms are built into a cave, as is often the procedure in this region. 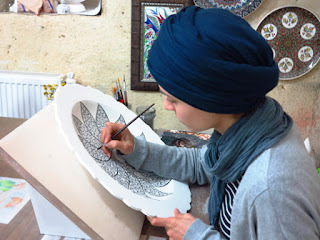 Hassan explained that two artists work on each piece of pottery—one crafts the piece and another paints the designs. Creating one piece can take several months depending on complexity of the design. Omurlu is one of only two places that can produce the Iznik tiles used in the Blue Mosque in Istanbul. 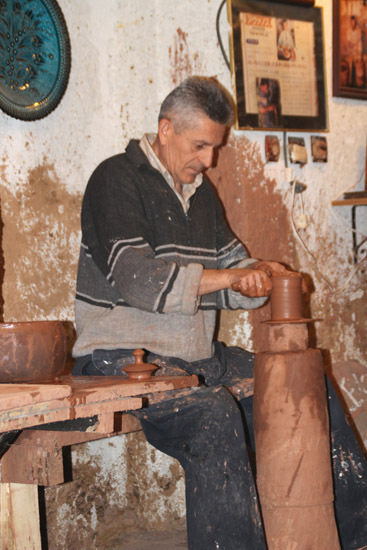 Red clay from the river is an important component, and artists demonstrated their incomparable skill in creating collector items as well as functional pieces that are dishwasher safe. The business is seven generations strong. 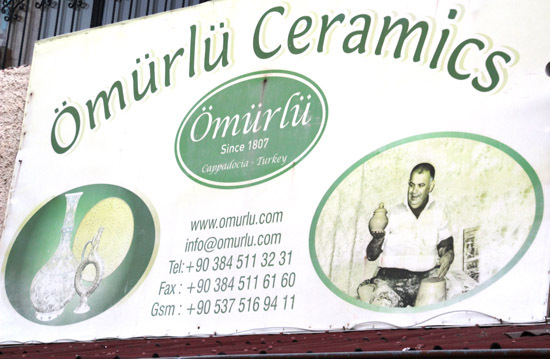 Hassan explained that there are different kinds of clay: Ceramic clay has chemicals, but Omurlu uses a quartz clay that is lead-free and absorbs higher heat resulting in more brilliant colors. A combination of 80% quartz and 20% red clay is used for many pieces. We watched as one of the potters created a piece on his wheel. Afterwards, Hassan played a traditional mandolin-type instrument called saz and sang Turkish songs while we waited for drinks—wine, tea, colas, or coffee-- to be brought in. Iznik has flowers, including tulip designs, the national flower of Turkey. Iznik type flowers can also be found on carpets, bowls, walls, and painted items. 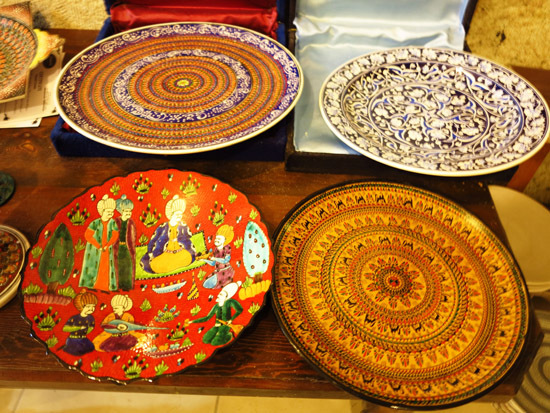 The Omurlu family style features intricate geometric patterns in vivid colors. The designs are creative and ornate and made of 80 percent quartz and 20 percent clay. Hitite style pottery uses primarily animal designs. Each piece is handmade and unique, and the company can custom make a pattern in any size a client might want. Plates take anywhere from 10 days to one month to make, but the Omurlu family style designs are the most difficult and many take even longer. Painting the intricate designs takes weeks, even months. Since pottery of any kind is my weakness, I felt the need to bring home an example of the finest, most detailed pottery I had ever seen. I bought a bowl painted in family style, a brightly colored geometric pattern with raised dots that added to design difficulty, a piece that Hassan said took two months to complete. I received it a few weeks after our return and was once again struck by its beauty.